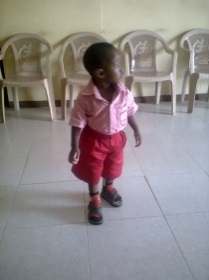 Wekem was born in January 2010 with what his local doctor had diagnosed as congenital pseudo-arthrosis. In simple terms his left tibia was short and curved as a false joint. In addition he had a malformed double toe on the same left leg/foot. This was really a shock to us. We spent about 9 months casting the leg with the hope of getting the same length as the right leg while waiting to operate on the double toe at a later year (1 or 2 years). At one point, we attained almost the same length for both legs. 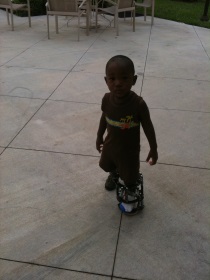 Wekem had his first surgery on June 29, 2011 at the age of 15 months. 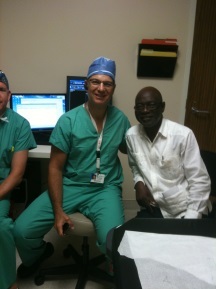 Dr. Paley and his team performed over 6 hours of surgery. Candice Earl, (Wekem’s girlfriend) was there to keep us abreast with the surgery and keeping us at ease! 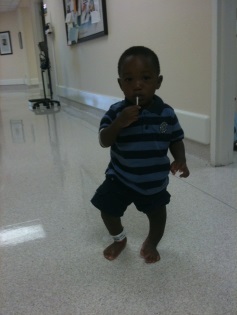 At the end of a difficult surgery, Wekem emerged with a brand new and beautiful toe! His recovery from surgery, his subsequent liveliness and enthusiasm to walk even two days after surgery was all a credit not only to Dr. Paley but also Wekem’s own spirit and determination to mend. We don’t know how to thank all the staff at the clinic for all their friendliness and moral support during our stay. We are blessed to have met all those wonderful people during our stay: the medical and administrative staff. Dr. Parley himself is a person who is very affable, exudes and inspires confidence in both his staff who seemed very highly motivated and his patients and clients. We also want to acknowledge Mr. Nat Luguchegi, an anesthetist (whom we found out is from the same town back home in Ghana as Wekem! ), Yvette Deinla, Physical Therapist, Tony Ritmiller, and of course Servando Gutierrez. We pray to God that Dr. Parley and his team will be around for a very long time to help children with these difficult birth defects.